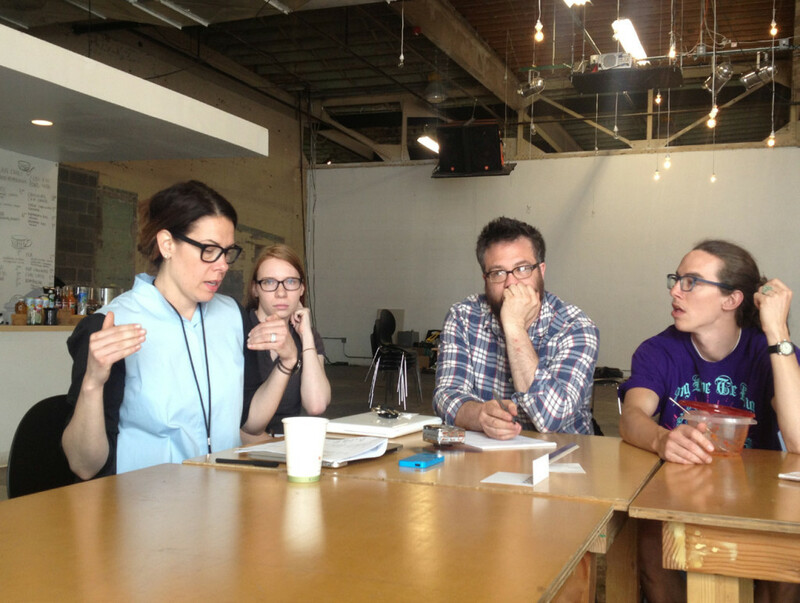 MOCAD’s new Executive Director, Elysia Borowy-Reeder, took up her post just before ArtX. 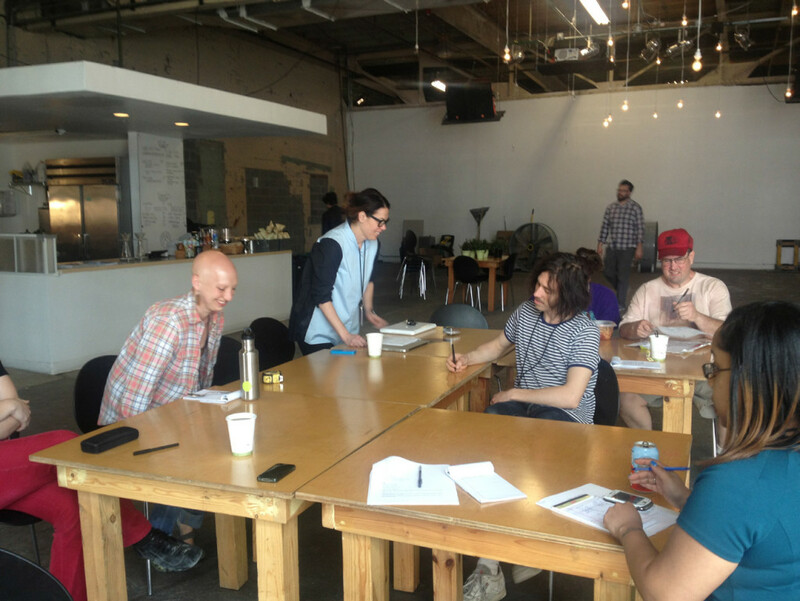 Detroit Research: Elysia, first, welcome to MOCAD, welcome to Detroit! You will be hearing this quite lot in the next few weeks and months. How has it been these past few days since your arrival? Elysia Borowy: I read that Patti Smith said, “Don’t move to New York move to Detroit.” I totally agree. I have done a few things since I arrived: found a CrossFit gym that I like a lot and found my way to work via the expressway and via Woodward Ave! MOCAD has an amazing staff that is really dedicated and doing interesting things outside of MOCAD – it has a political conscious- ness that makes me think that it will be an interesting place to lead. Plus! Randy Kennedy from the New York Times just called the Mike Kelley Mobile Homestead “the most provocative and unclassifi able work of art in America.” So week two can’t have gone any better. Elysia Borowy-Reeder, Exec. Dir. 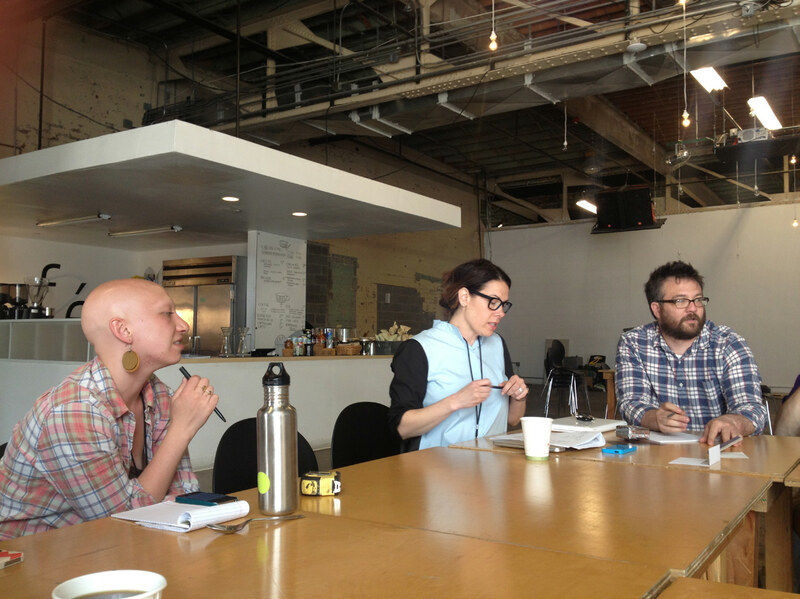 at MOCAD, directing project meeting for the opening weekend of Mike Kelley’s Mobile Homestead project. Photos courtesy of MOCAD. DR: I should share with our readers that I was fortunate enough to be on the search committee (led by Marsha Miro) which found you, so, obviously, I have got to know you quite well in a professional way, but can we start with you telling us something about your background. EB: I was born in Detroit and lived in the metro area (Hamtramck, Royal Oak, Grosse Point) and then moved to East Lansing where my mother worked at Michigan State University (MSU). I loved growing up in a college town. Interesting people, interesting speakers, and ideas; going there now it seems smaller, but growing up it seemed vast and vital. I spent a long time in graduate school at MSU. When I finished with my degree at Antioch College I was not ready to stop being a student. I thought I would either teach or work at a museum in the art education department. As I completed that degree I decided that I needed an art history degree. As I completed four years at MSU I started looking at museum work and I got a position at the MCA, Chicago where I worked for seven years. It was an amazing work experience with a dedicated and imaginative staff. I got to learn best practices and missteps. In many ways I learned how a solid contemporary art museum can and should run by working at the MCA, Chicago. Everyday there seemed to be something magical about the work that was happening there. It was compelling as they presented work that was accessible and cutting edge contemporary art at the same time. The MCA Chicago always put the visitor first and had very radical performances and programming to activate the museum. DR: You come to us immediately from Raleigh, North Carolina. Can we talk a little more about North Carolina? You have had the important experience of being a founding Director of a significant contemporary space in Raleigh. Can you tell us more about that experience? EB: CAM (Contemporary Art and Design) Raleigh is a special place for a few reasons. Contemporary art was and still is very new to Raleigh. The building was a re-use project and helped create a creative corridor in downtown and improve the economic landscape in downtown Raleigh by being an attraction. Raleigh also had a robust art and design education department at North Carolina State University, which is something that I am passionate about. As a program entity, CAM Raleigh is able to work with lesser-known artists because, as a non-collecting museum, it is neither burdened by the demands of caring for a permanent collection, nor bound by the limitations of marketability faced by commercial galleries. They encourage artists to ambitiously push themselves to new limits, empowered by an institution that bets its success on their ingenuity. Practically speaking, CAM Raleigh provided these artists with financial support for commissioned works; an inspiring, open space to be used in a creative fashion; lengthier exhibition runs than the standard gallery show; a professional museum staff for mentorship; the possibility for scholarly publication; expanded audience exposure; and a fertile environment for public engagement supported by robust, innovative programming. CAM Raleigh is [cheeky] enough to take calculated risks while standing on a solid reputation as a high-caliber arts institution. DR: Which one of your shows might you point to as especially emblematic of your taste in contemporary art? EB: There are two exhibitions that I am deeply proud of. Not only did they stretch the audience preconceived notions of what contemporary art is but also they transported visitors into deeper thinking. 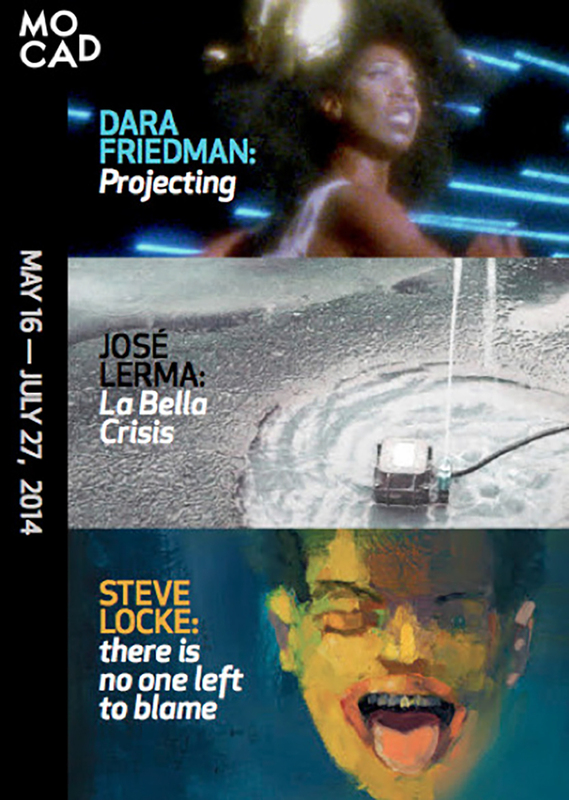 I think José Lerma is one of the most interesting artists working today. He suggests a new way to experience art and creates intricate installations that combine painting and non-traditional materials such as reflective fabrics and commercial carpet, relying on a compendium of mediums, references, and elements that combine his personal history and extensive academic accolades with his awareness of social history. Lerma originally migrated from Spain to Puerto Rico and now lives between Chicago and Brooklyn, and has multiple degrees in law and art. For the show that I curated at CAM Raleigh entitled The Credentialist, he created a new body of eighteen artworks commissioned for the main gallery and street level gallery space. This exhibition highlighted his ability to combine and collapse facets of history from his personal viewpoint. Central to the exhibition is the notion of rising and falling, particularly the precipitous demise of great historical figures. The records of these fluctuations are played out on various paintings, curtains, and carpets that occupy the space. Four large canvases, which imitate ballpoint pen doodle, depict themes such as war, love, and paradise while referencing paintings on the subject by Tintoretto and Piero della Francesca. In his paintings, Lerma employs images of Baroque style portraits of historical, famous French bankers from the 18th Century, which are signified by wigged portraits. The artworks in this exhibition were monumental, featuring a liberal use of brush strokes, doodles, and highlights of paint to underscore the sketch-like quality of the drawings. By distorting and often erasing the features of the faces, only leaving profiles or frontal views of wigs, Lerma’s work also references the paintings of Francis Bacon and Philip Guston. Lerma places his large works on electronic keyboards as a way of combining previous elements of his oeuvre. This provided a soundtrack to each painting — making the paintings active participants in the art. Through the use of acrylic spray paint on canvas, he was able to reproduce the aesthetic of highlighters and pen scratchings on a paper pad. His swirled scribbles are reminiscent of graffiti while doodles reference French political cartoon drawings. Lerma’s paintings meld these several diverse mediums to create works that resemble portraits of bureaucratic figures while simultaneously appearing to be topographical landscapes. Lerma builds up hues of paint and juxtaposes them alongside flat planes of white paint or ‘doodles’ of spray paint. 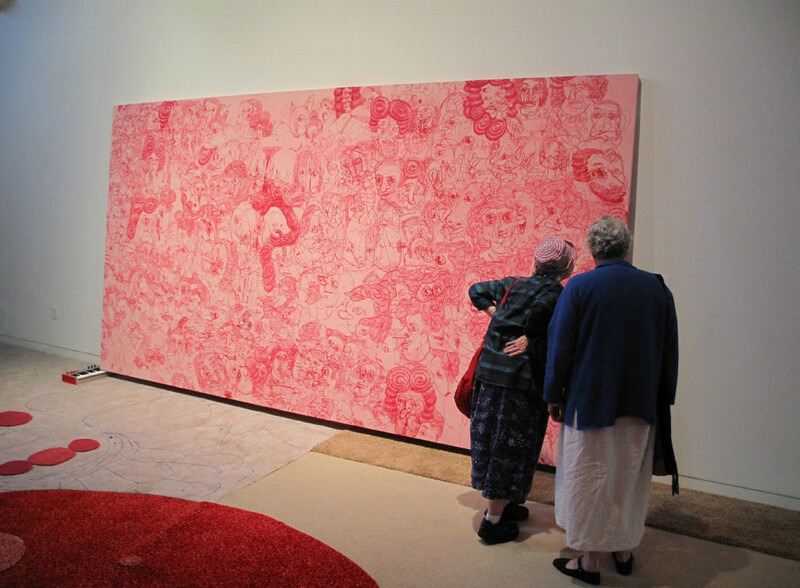 The main gallery of CAM Raleigh featured a large-scale carpet installation. Lerma paints and collages directly on inexpensive commercial grade carpets. The scale of the rugs affects the physical relationship of the viewer to the work – visitors physically walked all over King Charles II. The second exhibition that I loved and worked very hard on at CAM Raleigh, was an election show created by Jonathan Horowitz. Seeing North Carolina as a battleground state and Raleigh being the capital of the state, I thought the community would be engaged in the political scene. 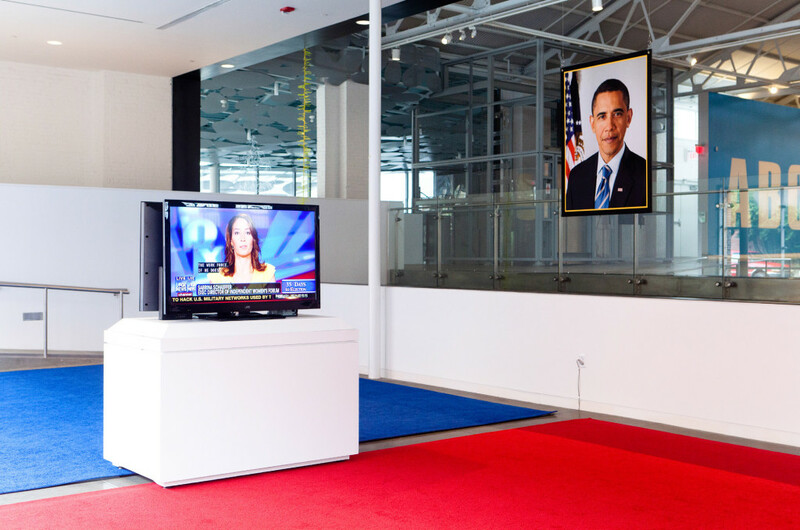 This exhibition took place at several art museums across the county and it was a reconfiguration of an exhibition staged by Horowitz during the 2008 presidential election. The exhibition entitled, Your Land/My Land, divides the gallery space into red and blue zones, refl ecting America’s color-coded, political and cultural divide. Suspended in the middle of the installation are back- to-back televisions, one broadcasting a live feed of Fox News, the other, of MSNBC. The exhibition transformed CAM Raleigh’s Street Gallery into a space for collective reflection and debate on both our political system. CAM Raleigh offered voter registration and hosted the presidential debates, in an attempt to encourage engagement in the political process and dialogue among community members. DR: Can you share with us something of the curators you admire on the national / international scene? EB: MOCAD has the great pleasure of working with curator Jens Hoffman. Jens was one of the major deciding factors on my decision to come to MOCAD. He presents exhibitions that have such amazing history while facing forward. For the fall exhibition at MOCAD Jens is working on an exhibition entitled The Past Is the Present. The Past Is the Present invites a group of international, national, and local artists to conceive new murals based on historical events associated with the city of Detroit. The inspiration for the exhibition is Diego Rivera’s Detroit Industry, a series of twenty fresco mural panels that he completed between 1932 and 1933 in the Great Hall of the Detroit Institute of Arts. This site is just two blocks north of MOCAD’s current location on Woodward Avenue in midtown Detroit. Jens has an incredible ability to fi nd relevance and content that is sometimes not thought about deeply enough. I also have a fondness for the Rivera murals, as growing up that was my favorite place at the DIA. The murals are so grand. They engulf the viewer. Artists under consideration include: Jennifer Allora and Guillermo Calzadilla, Julieta Aranda, Kevin Beasley, Tania Bruguera, Nicolás Consuegra, Minerva Cuevas, Harrell Fletcher, Claire Fontaine, Theaster Gates, Hans Haacke, Trenton Doyle Handcock, Maryam Jafri, William E. Jones, Daniel Martinez, Adrian Piper, Pedro Reyes, Martha Rosler, Slanguage, and Hank Willis Thomas. DR: That’s quite a list! EB: Exactly 80 years after Rivera’s mural, MOCAD is inviting this group of artists to each create a new mural depicting an event from the history of Detroit. The objective is to identify some of the key moments that have strongly impacted the development of the city, and may even still affect how it is perceived and experienced today. The murals will depict and document the struggles of Detroit, which in the 1930s and 1940s was one of the world’s premier industrial cities but has subsequently had to deal with the dramatic decline of the automotive and other industries, enormous losses in population, epidemic crime, unemployment, political corruption, and poverty. I think it will provide compelling points for refl ections. I feel that we are all designers of our world and need a mirror from time to time to make sense of the chaos. The selected artists are not all necessarily associated with the making of murals, yet they all engage with history in their work and regularly address, examine, and criticize the political and social realities of contemporary society. Through the presentation of the exhibition, MOCAD is taking this opportunity to re-establish and fortify the history of the mural in Detroit, encourage the community to reflect on the present state of murals, and shape the future direction. DR: Now, here you are at MOCAD, in Detroit. MOCAD is at a crucial stage of its development / growth. What does this represent for you? What challenges do you see? EB: “What challenges do you see?” I am not sure if I see challenges, I really see opportunity, room for collaboration, I see change which is about how can we be the best museum and work within the context of resources. We all dream big. I see a very smart engaged community, board, and staff. Also, I am really happy that the community, staff, and board are vocal people. They share their thoughts and perspectives and most importantly, when it really matters. DR: Can we talk about “vision”? Obviously, no one expects you simply to come in and say, Here is my vision for MOCAD! Still, it would be nice to get a sense of how you think you might go about acclimatizing yourself to (i) the Detroit scene and (ii) MOCAD’s possibilities in the larger ecologies of national and international contemporary art? EB: MOCAD seeks to curate the most contemporary works of art including performance when possible – those still emerging, growing, and living. It is my hope that we spark new thinking by creating ever-changing experiences that explore the newest thoughts and ideas. We also like to present art that is totally unexpected. Many times we will present artists that you have never heard of. I like to say that we exhibit the Warhol’s of tomorrow. On May 10, 2013 MOCAD launched a very special project by Detroit-born artist Mike Kelley. Mobile Homestead is a permanent artwork by late artist Mike Kelley located on the grounds of the Museum of Contemporary Art Detroit. It’s both a public sculpture and a private, personal architecture – based on the artist’s childhood home on Palmer Road in Westland. MOCAD’s Department of Education and Public Engagement programs the ground floor of Mobile Homestead as a community space, as Kelley intended. The project was eight years in the making and will serve as a hub for gatherings, conversations and displays that are created by and for a diverse public, and is intentionally unaffiliated with the Museum’s exhibitions and public programming. This project is just one of the many examples that show how Detroit is gaining culture power. It is a city in the middle of everything and at the center of nothing. I think in many ways Detroit exists in defiance of the hype and showiness of cities like New York or Los Angeles. I think the MOCAD board, volunteers, visitors, staff and I will enjoy writing and designing MOCOAD’s next chapter. DR: And what about education / public engagement? EB: I think this is one of the most important aspects of a museum. MOCAD has a radical Department of Education and Engagement. I consider MOCAD a laboratory for new ideas both in art and design. There is a department of public engagement, along with a department of education of which Katie McGowan is the curator, and both such amazing programs. Greg Baise curates lectures and performances for every visitor and it is mind blowing. Next fall we plan on launching a Teen Council and a Jr. Docent program which are programs that were very successful at CAM Raleigh. I think the Jr. Docents will go through some highly transformative thinking when trained on the mural exhibition. I often think about the visitor experience and what they walk away with; it is for this reason I am particularly excited about the Jr. Docent program. The main goals of this program are to enable the young MOCAD docents to develop the skills and confidence necessary to describe and interpret visual art; we will encourage students to think in new ways about art and its relationship to their own lives. This in turn helps build confidence in their own interpretation of the world around them. DR: The development of the Jr. Docent program would be a wonderful thing! Your husband is the painter Scott Reeder – a very fine artist, if I may so say. Will he be engaging Detroit? EB: That is really nice to hear. Yes! He is tenured at SAIC [School of the Art Institute of Chicago] and will be looking for a studio here in Detroit come the end of the school year. He is really happy to be here where there is a strong art community both people like you, Michael, and other artists who are makers.